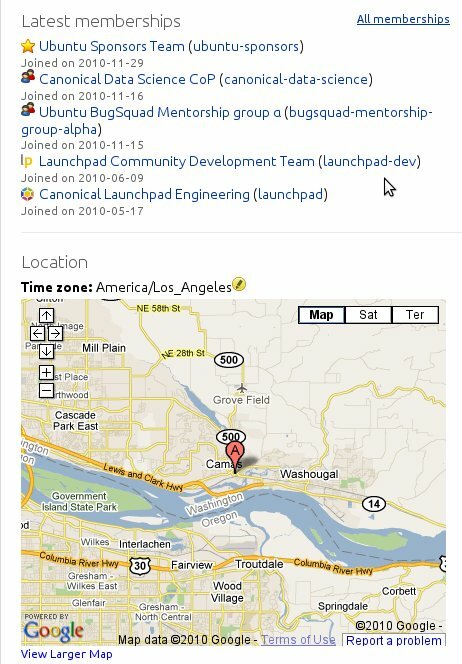 When the Launchpad API first came out one of the first things I noticed was that it was possible to set your latitude and longitude via the API. After seeing this I remembered some book called Cryptonomicon where one of the protagonist’s has their geolocation in their email signature and thought it would be neat to update my geolocation in Launchpad as I traveled. Alas, I wasn’t able to get setLocation to work at all with the API. When I was working on the Launchpad team at the EPIC in July I remembered the issue I was having and discovered that I was doing it wrong. I needed to use launchpad.people[‘brian-murray’].setLocation() and not launchpad.me.setLocation(). Then Google Maps were removed from people pages like mine and I was sad again. Surely, there is is a happy ending to this sad tale? Indeed, Santa has arrived a bit early and brought me a Launchpad Greasemonkey script that displays Google Maps on Launchpad user pages again. It is now available in firefox-lp-improvements. So please set your location to interesting and approximate places!